Canadian Accounts Payable check on top with one long stub. Perforated into 3 equal panels. High security Accounts Payable check on top and one long stub with 23 security features including a foil hologram, Toner Adhesion and Heat Sensitive Icon printed on Chemically Reactive Paper. Perforated into 3 equal panels. Accounts Payable check on top with one long stub. Perforated into 3 equal panels. Accounts Payable deposit advice with check on top and one long stub. Perforated into 3 equal panels. Canadian Accounts Payable check on top with two stubs. Perforated into 3 equal panels. High security Accounts Payable check on top with two stubs. Perforated into 3 equal panels. Accounts Payable check on top with two stubs. Perforated into 3 equal panels. Accounts Payable deposit advice with check on top and two stubs. Perforated into 3 equal panels. Canadian multipurpose check on top with one long stub. Perforated into 3 equal panels. High security multipurpose check on top with one long blank stub. Security features include a foil hologram, Toner Adhesion and Heat Sensitive Icon printed on Chemically Reactive Paper. Perforated into 3 equal panels. Multipurpose check on top with one long stub. Perforated into 3 equal panels. Multipurpose deposit advice with check on top and one long stub. Perforated into 3 equal panels. Canadian accounts payable check in the middle with two vouchers top and bottom. Perforated in 3 equal panels. Accounts payable check in the middle with vouchers top and bottom. Perforated in 3 equal panels. 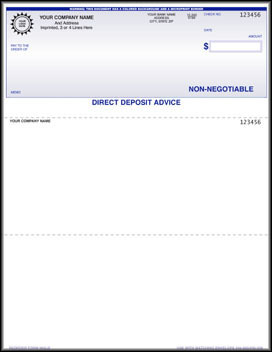 Accounts Payable direct deposit advice, check in the middle, with vouchers top and bottom. Perforated in 3 equal panels. Canadian accounts payable check on bottom with two vouchers at top. Perforated in 3 equal panels. High security accounts payable check on bottom with two vouchers at top. Security features include a foil hologram, Toner Adhesion and Heat Sensitive Icon printed on Chemically Reactive Paper. Perforated into 3 equal panels. Accounts payable check on bottom with two vouchers at top. Perforated in 3 equal panels. Accounts payable deposit advice with check on bottom and two vouchers at top.